We offer A TRUSTED SERVICE you can rely on to deliver. Suitable for cycling clubs, corporate & charity events and even running clubs. Printed using our signature PREMIUM sublimation technique. We will BEAT all like-for-like prices on custom neck warmers. Premium sublimation print for durability and quality. Scimitar’s custom neck warmers for cycling are excellent products to support your training demands. Also known as neck tubes and buffs, we are specialists in the design and manufacture of neck warmers to your exact bespoke requirements. Using moisture-wicking Qwick-Dri™ fabric, our buffs offers comfort by moving moisture away from the skin quickly and efficiently. The tubular, seamless construction also ensures your custom neck warmers won’t rub. Our experienced design team will work with you to ensure your branding stands out in the most effective way. The sublimation print process we use in our neck warmers also ensures you can replicate any design in any number of colours. Our Qwick-Dri™ moisture wicking fibres accelerate the movement of moisture away from your skin, rapidly maintaining body temperature and ensuring comfort at all times. Qwick-Dri™ washes on cool temperatures and dry quickly, naturally. We offer a wide range of bespoke cycling accessories, including arm warmers and cycle gilets. Call us today on 01905 425324, fill in the online forms at the top of our website or email sales@scimitarsports.com and we’ll get back to you within 12 working hours. 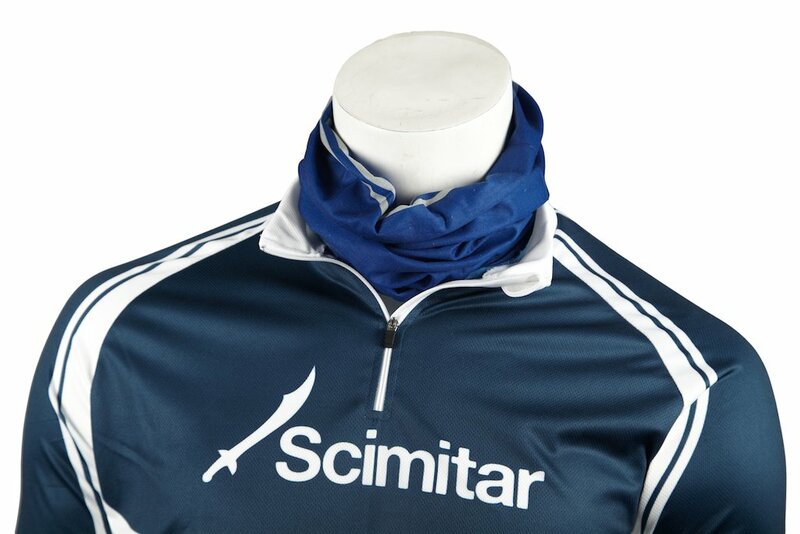 WHY SCIMITAR FOR CUSTOM NECK WARMERS? Pantone perfect matching with your cycle club colours. Corporate & charity cycling events.